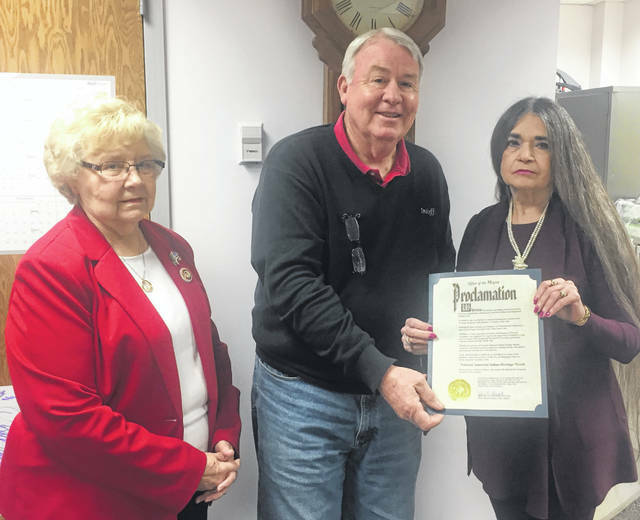 From left are Frances Sharp, DAR Regent; Mark McKay, Wilmington City Council President presenting the proclamation signed by Mayor John Stanforth; and DAR American Indians Chair Carol Darnell. WILMINGTON — November is National American Indian Heritage Month. Mayor John Stanforth signed a proclamation and it was read and presented to representatives of the National Society Daughters of the American Revolution by Wilmington City Council President Mark McKay on behalf of the mayor. The month is a time to celebrate rich and diverse Native cultures, traditions and histories and to acknowledge the important contributions of Native people. It’s also an opportunity to become aware of the unique challenges Native people have faced both historically and in the present, and the ways in which tribal citizens have worked to face these challenges. Several opportunities are available to learn about Native people this month. The Ohio History Center in Columbus will have a food truck serving Native food Nov. 9-10 (https://www.ohiohistory.org/participate/event-calendar/ohio-history-center/native-american-food-truck). The National Society Daughters of the American Revolution works to educate members and the public about Native people and annually meets with the Mayor to receive and promote the proclamation.